Congratulations on your decision to join the Spring incoming class and make Landmark College your college! These pages will be your resource on the steps to take before your arrival, as well as information about campus life at Landmark College. All new students are required to attend all aspects of Orientation. Family Orientation sessions are optional, but we strongly encourage families to attend these sessions. Please plan arriving on campus on Thursday, January 24, between 9 a.m. and 12 noon for Student Registration/Orientation. Follow the signs on campus to locate the Strauch Family Student Center. There is ample parking in the parking lot adjacent to the Click Center. 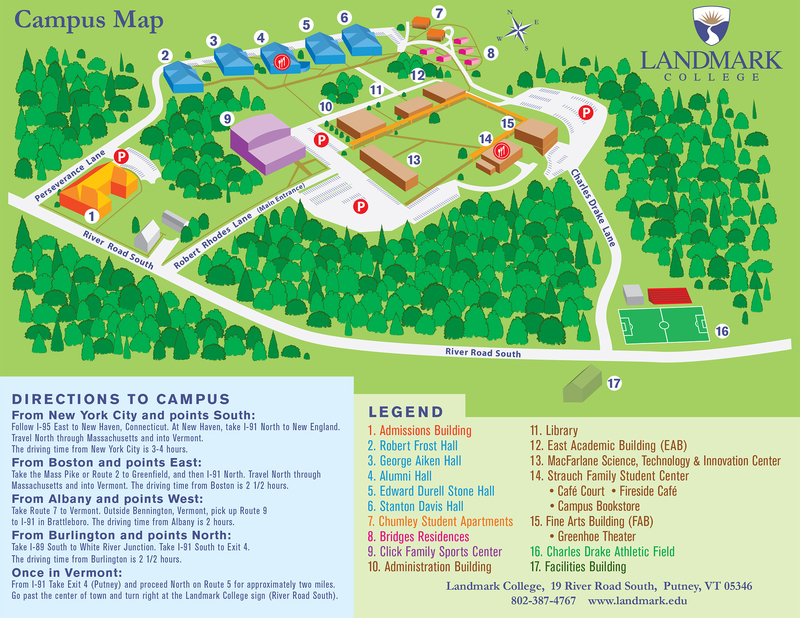 View the Campus Map. Students will move into their Residence Hall immediately following registration. Typically, student registration takes approximately 30 to 90 minutes to complete. Students and families will be able to drive their personal vehicle to the student’s specific Residence Hall to unload belongings for the room. Parking for the day will be in a parking lot close by the halls. Students will stay on campus Thursday night and each night thereafter. Lunch on Thursday is complimentary for families. Orientation sessions for students begin at 2 p.m. on Thursday and will continue throughout the day and evening. Student orientation continues on Friday, Saturday, and Sunday. There is a Convocation Ceremony that begins at 9:30 a.m. on Saturday, January 26th. Convocation is an official start to the semester and will include faculty, staff, students, and families. Convocation takes place in the Greenhoe Theater Fine Arts Building. View the full student orientation schedule and family orientation schedule. Lunch: 11:30 a.m. – 1:45 p.m.
Student & Family Welcome: 2 – 2:20 p.m.
Student & Family Orientation Sessions: 9 a.m. – 4 p.m. Lunch 11:30 a.m. – 1 p.m.
President’s Family Reception: 4 – 5:30 p.m.
Student Orientation Sessions: 1 – 5:30 p.m.
Evening Session for students: 7 p.m.
Student Orientation Sessions: 8:30 a.m. – 5:30 p.m. If you have any questions regarding specific aspects of Orientation, please contact Student Affairs at 802‑387‑6714.